For neutral looks, it’s always the usual blacks and browns, but it can get monotonous after a while. One way to spice up such a look without venturing too far from your comfort zone would be to use a very dark olive green/brown. For this, I highly recommend the much loved Metallic Brass from GOSH. I will tell you now that Metallic Brass is my favourite, my very favourite, my very very favouritest eyeliner. Slight digression: I forget now who it was but someone once mentioned it and I agree wholeheartedly that GOSH should consider making a nail polish called Metallic Brass. 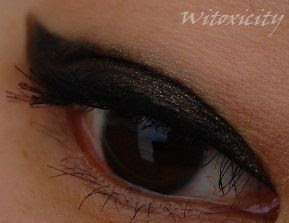 The Velvet Touch Eye Liners from GOSH are not only affordably priced but they are also longlasting and are waterproof. There are many colours in its range but Metallic Brass is the one I find most intriguing. It’s a dark olive green/brown with fine gold shimmer specks. Neutral with pizazz. I use it to line my eyes after I’ve applied eyeshadow but more often than not, I like to just use Metallic Brass as the sole source of colour on my eyes. 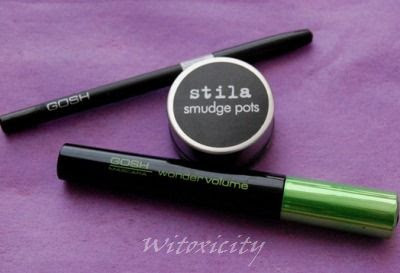 It’s a quick and easy look and as it is a pencil eyeliner, it’s much more convenient to apply than with a liquid eyeliner. 1. Draw on a very thick line of Metallic Brass. Do a thick but gentle wing. 2. 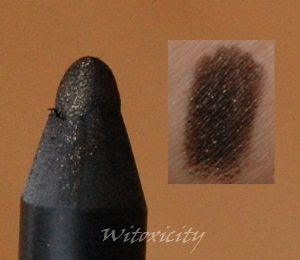 Smudge slightly the upper edge of the thick line with a sponge-tip applicator. 3. Tightline with the gel eye liner (alternatively, tightline with Metallic Brass). 4. Curl lashes and apply mascara. Leave the lower lash line totally bare so that the thick line of Metallic Brass stands out even more. This is my favourite look when I’m short of time (and that’s often!). Give it a go. Eye looks don’t always have to involve eyeshadows. 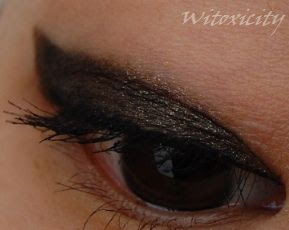 i always do a thick wing, coz i have monolids ^^ wish i can get some gosh! 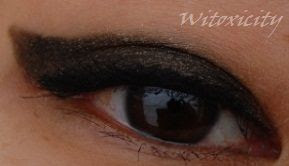 i tried a similar winged look recently & must say using a pencil is much more easier & faster. 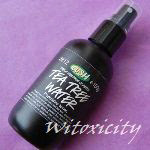 You can get the desired look within minutes!